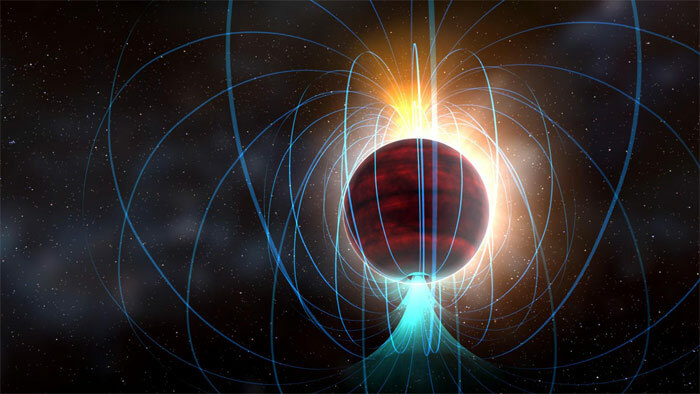 The star’s extraordinary magnetic field is potentially associated with a constant flurry of solar-flare-like eruptions. As with our Sun, these flares would trace tightly wound magnetic field lines that act like cosmic particle accelerators: warping the path of electrons and causing them to emit telltale radio signals that can be detected with ALMA. "If we lived around a star like this one, we wouldn’t have any satellite communications. In fact, it might be extremely difficult for life to evolve at all in such a stormy environment," says lead author Peter Williams of the Harvard-Smithsonian Center for Astrophysics (CfA) in Cambridge, Massachusetts. The star is a mere 10 percent the mass of the Sun and is so small and cool that it's right on the dividing line between stars (which fuse hydrogen) and brown dwarfs (which don’t). One of the things that make this small star remarkable is that it spins rapidly, completing a full rotation about every two hours. Our Sun takes about 25 days to rotate once at its equator. Previous data from the National Radio Astronomy Observatory’s Karl G. Jansky Very Large Array in Socorro, New Mexico, show that this star exhibits a magnetic field that rivals the Sun’s most extreme magnetic regions and is several hundred times stronger than the Sun's average magnetic field. This puzzled astronomers because the physical processes that generate the Sun’s magnetic field shouldn’t operate in such a small star.